Following consecutive years of growth, in 2017 the US automotive market recorded the first decrease in sales since the 2008 credit crisis. According to the International Organization of Motor Vehicle Manufacturers, OICA, US vehicle production decreased 8% year-on-year in 2017, to 11.2 million units, while registrations or sales of new vehicles declined 2.2%, to 17.5 million units. That said, car sales have been resilient in H1 of 2018, with many of the larger players posting sales increases. Despite rising interest rates and more choices of late-model used vehicles, strong economic performance, low unemployment and tax cuts have helped to drive sales. 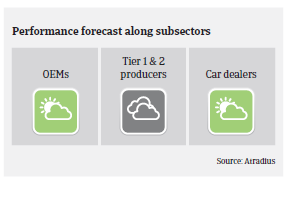 The car dealers segment has enjoyed favourable trading conditions in recent years with subsidies, affordable financing readily available and above average consumer confidence. The postponement of a 25% tariff on vehicles and auto parts imported from the EU has not removed uncertainty in the market. While still recording solid operating results, large OEMs have lowered their profit forecasts for 2018, citing higher steel and aluminium prices caused by recently imposed US import tariffs on both commodities. General Motors recently stated that they estimate a USD 600-700 million cost increase in 2018, while Ford reported that the tariffs increased their costs by USD 150 million in H1 of 2018 alone. Domestic steel producers have already increased their prices in reaction to the tariffs, and rising prices for steel and aluminium could negatively impact businesses profitability and cash generation, especially for Tier 1 and Tier 2 producers. Their ability to pass on price increases is key in this respect. 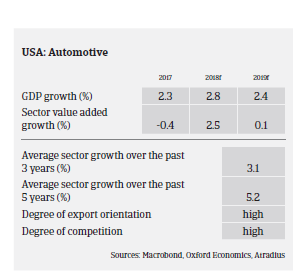 US automotive businesses tend to be highly leveraged since the sector is very capital-intensive. Access to external funding has steadily improved since the 2008 credit crisis, due to improved trading conditions within the sector, relaxation within the traditional credit markets and access to funding via government-backed programmes. 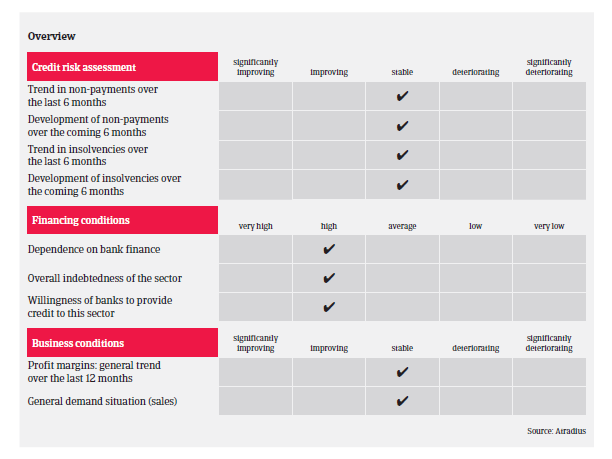 Banks are generally willing to lend to the industry. The average payment duration in the US automotive industry is 30-60 days. Payment behaviour in this sector has been satisfying over the past two years. The number of protracted payments, non-payments and insolvency cases has not increased in 2017 and H1 of 2018. However, any future imposition of tariffs on car parts and vehicle imports would severely impact the industry, most probably leading to increasing insolvencies. The suggested tariffs would ultimately hurt US consumers, who could experience fewer options and higher prices across the board, as even domestic manufactured vehicles use imported parts. Another challenge that the automotive industry is facing is the transition from traditional combustion engines to alternative fuel/electric technology. With a number of countries announcing policy changes to phase out gasoline and diesel engines, this puts pressure on OEMs and core suppliers to invest in the development of alternative fuel/electric vehicles. While we are seeing a number of electronic vehicles being added to ranges there is still a number of hurdles that the industry faces, such as making the technology more affordable, improving the range of fuel cells and improving infrastructure (charging stations). 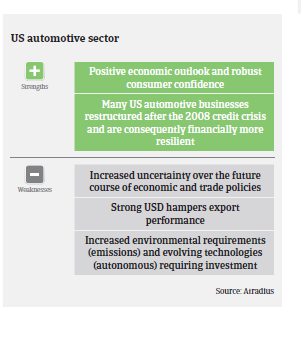 Despite the looming downside risks we still have a positive underwriting approach to the automotive sector for the time being. At the same time we continue to monitor developments in US trade policies, which could have a disruptive impact on the industry and ultimately lead to a change in our risk appetite.